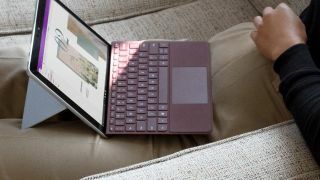 If you were wondering when Microsoft’s accessories for its freshly revealed wallet-friendly Surface Go tablet would be available, then we’ve got good news on the Type Cover front, because the detachable keyboards are now up for pre-order. You can bag yourself a plain black Type Cover, or a ‘Signature’ Alcantara Type Cover in burgundy, cobalt blue or platinum, and the accessories will be on sale at the same time as the tablet itself, as you would expect. That’s on August 2 in the US, August 23 in the UK, and August 27 in Australia. In the US, the black Type Cover will set you back $99.99, with the Signature keyboards being slightly more expensive at $129.99. In the UK, the price is £99.99 and £124.99 respectively, and in Australia, you’ll fork out AU$149.95 and AU$199.95 respectively. Those in the education sector (teachers, students or parents) and members of the armed forces will get a small discount of a fiver or just over. Don’t forget that Microsoft launched a new Surface Mobile Mouse alongside the Surface Go, which is also up for pre-order. According to Microsoft’s online store, that peripheral will go on sale on August 2 in the US costing $34.99, and August 22 in the UK priced at £29.99. In Australia, it will be available on August 27 with a price tag of AU$54.95. In other words, the same date as the Type Covers, except in the UK when the mouse mysteriously appears a day earlier (although that could be a mistake on the site).